Pumpkin recipes are out in full force on the web. 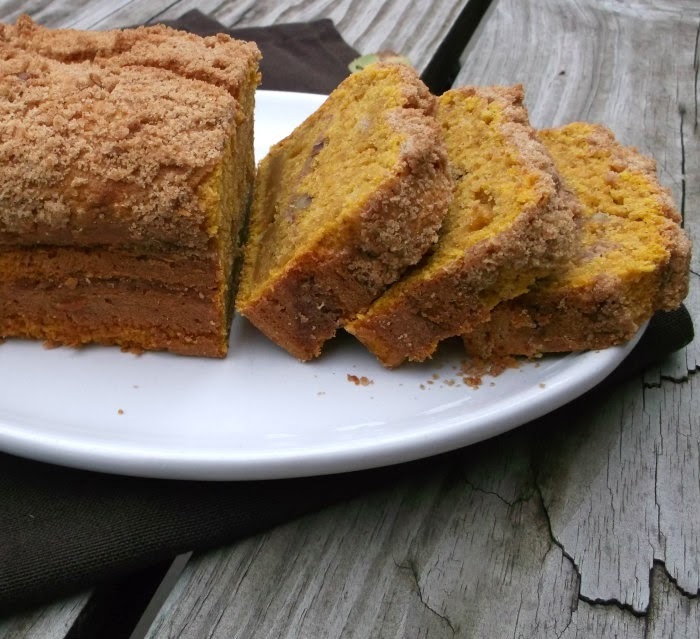 I have seen so many yummy pumpkin recipes on so many blogs. I have jumped on the band wagon too; this is not my first pumpkin recipe on my blog for the fall season. I have made a batch of pumpkin muffins that I shared a few post back. That is what brought me to this yummy cream cheese pumpkin bread. I had bought a large can of pumpkin and after I had made the muffins I had enough pumpkin left to make another recipe. Since I love quick breads and I found a recipe that was totally different than I have made in the past I couldn’t resist sharing this. 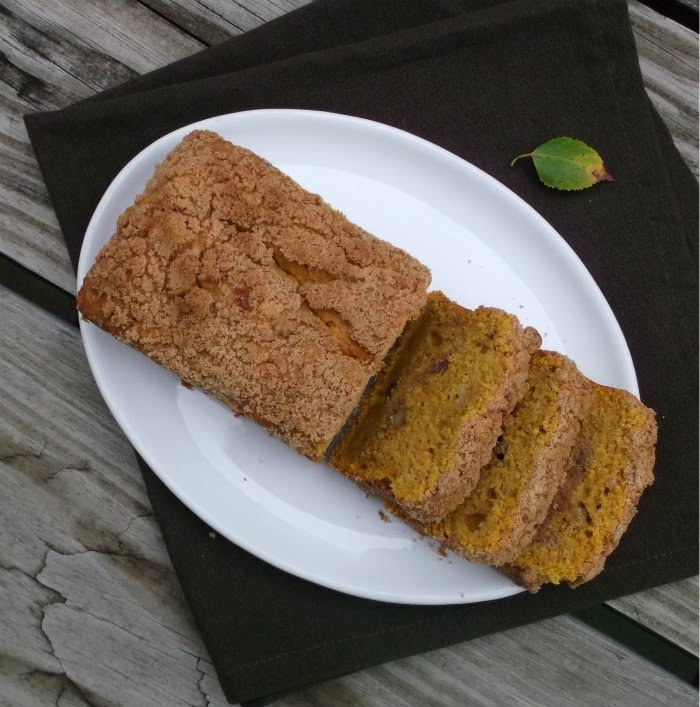 This pumpkin bread is super moist and loaded with flavor. 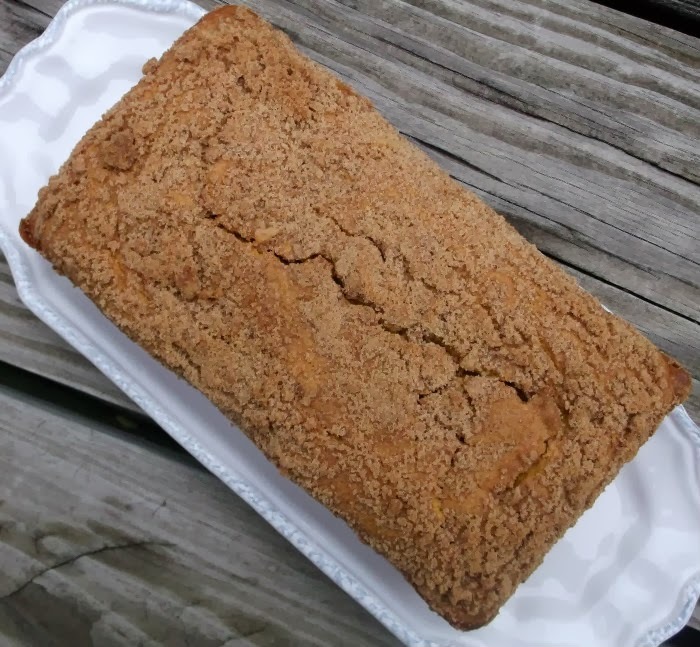 You will find cream cheese along with the pumpkin in this recipe so how could it not be moist. I also added some streusel to the center of the bread and added a little to the top of each loaf. The nice thing about this bread it can be served as a quick breakfast or you can be served as a dessert after lunch or dinner. It makes two large loaves, so you can put one in the freezer for a later date… if you have any left. 3. In a medium bowl and with an electric mixer at medium speed, beat cream cheese and butter until fluffy. Add eggs, on at a time, beating well after each addition. 4. In a medium bowl, combine flour, baking powder, baking soda, and spices, stirring to combine. Gradually add flour mixture to cream cheese mixture, mixing until blended. Stir in the pumpkin until well blended. 5. Spoon half the batter into prepared loaf pans dividing between the two pans. Sprinkle with half the streusel dividing between the two pans. Add the rest of the pumpkin mixture over top of the streusel, covering the streusel completely. Over the second layer of pumpkin mixture sprinkle the rest of the streusel. 6. Bake for 1 hour, or until a tester inserted in the center comes out clean. Cool in pans on wire racks for 10 minutes; remove from pans and allow to cool completely on wire racks. Right…IF you have any left. LOL This looks delicious! Pumpkin and cream cheese were meant for each other! What a gorgeous loaf! I need to make this for my youngest who will be home for fall break next weekend! It looks divine! Great looking stuff! I’m loving all the pumpkin recipes I’m seeing, but this bread really stands out. Thanks so much. It looks amazing! So moist and delicious.